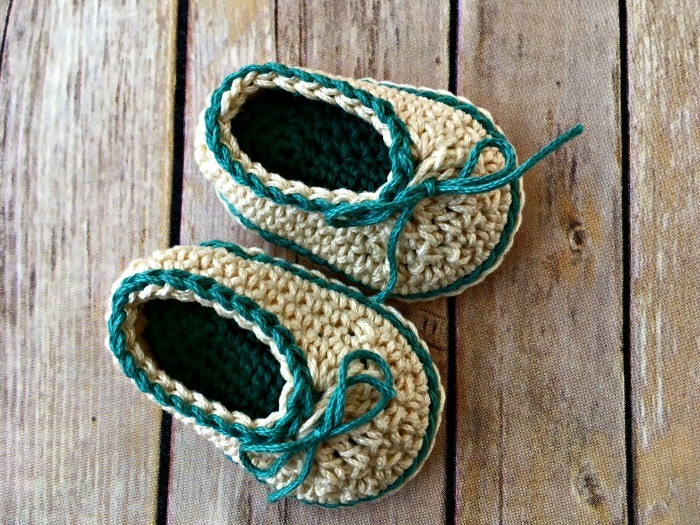 Basic Baby Booties - Free Crochet Pattern - love. life. yarn. I don’t know about you but I just love making baby things. Maybe it’s because they work up so quickly. Or maybe because they are so gosh darn cute. Or maybe because we have three boys and the youngest is just leaving the baby stage and I’m missing having a baby in the house. Whatever it is, I’ve been doing a lot of baby items these days. Baby dresses (which I don’t have any use for at home with three boys! ), baby onesies, and now baby shoes. I’ve seen so many cute crochet baby booties and wanted to try my hand at designing some of my own. This is my first pair and they have turned out pretty well! I used Lion Brand 24/7 cotton for these because I love cotton yarns and wanted something as close to their Cotton Ease as I could get. LB Cotton Ease was one of my absolute favorite yarns when I first started designing. It has been discontinued but the website recommended 24/7 Cotton as a suitable substitute so I ordered a couple of skeins online and waited patiently for them to arrive. When they did I couldn’t wait to get started on this pair of shoes and now I have waited for testing and it’s time for me to share the pattern with you! I also can’t wait to create lots of variations of these basic baby booties in different yarns – I have so many ideas for booties now I don’t know how I’m going to get them all done! Buy yarn for this project here! Round 4: Ch 1, sc 9 (11), dc3tog, tr5tog, dc3tog, sc 9 (11) – 21 (25) sts. Leaving a long tail, join CC at center front. Sl st evenly around top of shoe, then use hook to draw tails through in the stitches below as seen in photo above. Tie in a bow and there are no CC ends to hide! Aww adorable! I am planning to make one for my pregnant co- worker. Will this pattern work with 5 mm hook? 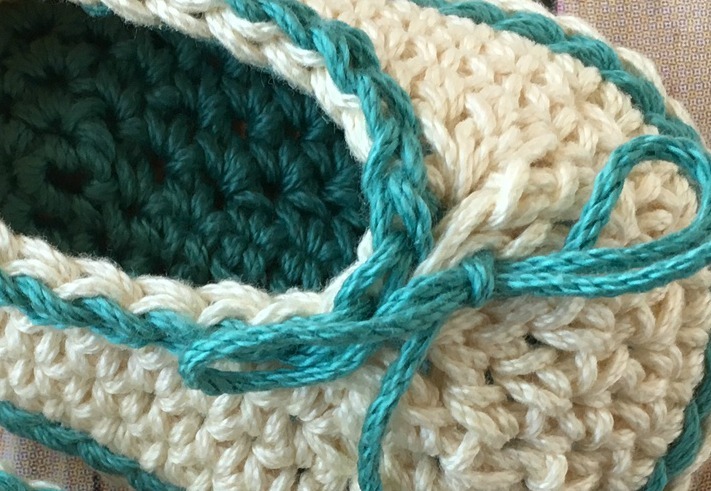 If you use a larger hook you will get a larger shoe but the pattern will work up the same. The stitches will be looser. I’m not sure what size it would end up – maybe a 12-18 months? Thanks so much for the pattern! The booties are so beautiful! Row 4 – soles, is it missing something? Also, round 2 of the body doesn’t add up for me. Hi Winnend! Do you have too many or too few stitches? Are you marking the first stitch of each round? Sometimes I find that I have trouble telling which is the first stitch of the round if I don’t mark it. Let me know your stitch counts so I can try to see if we can find the difference. Let me know your numbers for the soles and round 2 of the body. Hi Amanda, Thanks for replying so soon. join to first sc with slip st – 35 (39) sts. I’m working on videos for all my baby shoes patterns and I know that will help – it’s just hard to find quiet time to film with three small boys in the house – but I will get the videos done soon! You are right, of course. Thanks for your explanations – I see it now. Great! I’m glad we figured it out. 🙂 Keep crocheting – it’s really addictive! Thank you for this cute basic pattern. FYI these do look a little masculine referring to your comment on your Mary Jane article. Given the right color choices it can go for a boy or a girl. I’m going to make some in black and red for my grandson. Thanks again, God bless. Que significa sc? Y sc2tog? Pb es punto bordado? Si existe un video se me haría más fácil poderle bacer estos zapatos a mi bebé. ¡Hola! Sc significa ganchillo individual. Sc2tog es una disminución que lleva dos crochets individuales en uno. No sé qué es Pb. No tengo un video para este patrón, pero otro patrón mío que es muy similar tiene un video completo. Sólo tendrá que trabajar una ronda o dos más de lo que muestra el vídeo. I love the booties! I am working on finishing my first one and seem to be having trouble getting the tr5tog together without a gap between each tr. Any suggestions? Hi Mary! Is the gap between the stitches themselves or at the top? Mine have a gap at the top but the slip sts in the contrasting color hide them well. If it is between the stitches, try a smaller hook on just that part and see if it helps. ? 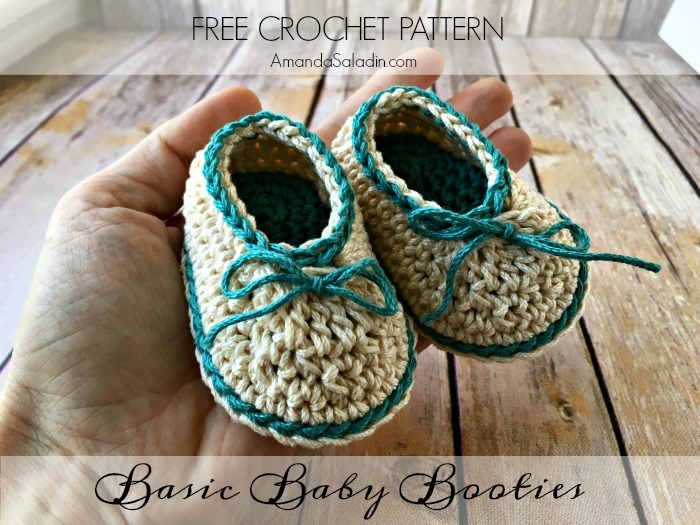 Hello, I’m new to crocheting/self learner and I’m starting a pair of these for my niece, and then I’ll make a pair for my soon to be first. I’m sorry to say I’m stuck at the very first step: Ch 8 (10). If I’m chaining 8, why should I have 10 chains? Can you help me out? Thank you! And actually, I just completed row 1, and I’m totally confused about the steps following 7 dc in last stitch. Where exactly do the following stitches go? I ended up with a strange shape after I completed row 1 and wasn’t really sure where to start row 2. If you have a video, that would be very helpful! Thanks! Hi there! I love this pattern and have just subscribed. Do we start with a slip knot on the hook to ch 1? 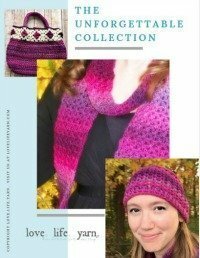 What does it mean by “sc in each slip stitch”? I don’t know how we go through the slip stitches – is it meant to be “sc in each stitch around”? Do we go through both layers of the sole for the first row of the body or just through the CC? Thank you for this cute pattern. Quick question: can you walk me through how you do the tr5tog? I followed a video tutorial from YouTube, but it left a larger than normal gap at the end of the last stitch. Thanks! Thank you for your speedy response. I really appreciate it. That is how I did the tc5tog. I’ll try to pull the next stitch a little tighter next time. I’m really enjoying all of your patterns. Thanks for sharing them! Super cute pattern with really easy to follow instructions. You make it easy to create beautiful items. Thanks for sharing your patterns.